Podipaarana song Lyrics from Queen Malayalam movie. Lyrics of Podipaarana is drafted by Joe Paul. Podipaarana song is sung by Ajaey Shravan, Kesav Vinod, Sunil Kumar. The film features Vinod Kedamangalam, in lead roles. 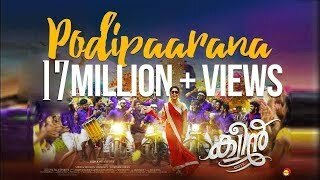 Lyrics to Podipaarana song,Podipaarana song translation in english. Ivaril ini nin madhuram mathiyil..
Ivaril ini nin madhuram mathiye..